Having trouble getting those fruits and vegetables in your backyard to grow? Don't blame the bees. A new study from San Francisco State University shows that native bees are able to provide adequate pollination service in San Francisco, despite the urban setting. And, in what appears to be good news for farmers in space-starved cities, the amount of pollination a plant received was driven not by how large the garden was, but how densely it was populated with flowers. To research the effect of native pollinators on tomato plants in San Francisco, SF State Professor of Biology Gretchen LeBuhn and then-graduate student Drew Potter placed bags over some of the plants' "floral clusters," preventing bees from visiting, while leaving other clusters open to the air. The research was published Jan. 15 in the journal Urban Ecosystems. "What this shows is that just because you're in an urban setting doesn't mean that bees aren't providing important pollinator service, and not just honeybees," said Gretchen LeBuhn, a professor of biology at SF State and co-author of the study. "Our wild bees here are providing all the service you might need." LeBuhn has extensively studied the decline of pollinators across North America and since 2008 has led the nation's largest citizen science project focused on pollinators, which conducts an annual census of bees. 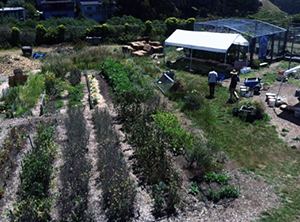 According to the City of San Francisco, more than 1,700 volunteers tend nearly nine acres of land managed by the Recreation and Park Department through its Community Gardens Program, with 750 additional residents on a waitlist to join the program. Previous research had shown that "pollinator deserts" such as the Central Valley of California lack the amount of bees needed to provide adequate service to plants compared with wildland areas, but LeBuhn and Drew Potter (M.S. '13), a graduate student at the time, wanted to know if the same trend applied in urban areas. To find out, they placed sets of three tomato plants in gardens throughout San Francisco for two weeks, with each plant divided into four sets of "floral clusters” that received a different pollination treatment. One cluster was covered to prevent bees from visiting and limited only to self-pollination, one was left open and available to be pollinated by native bees, and two were covered but received artificial pollination. 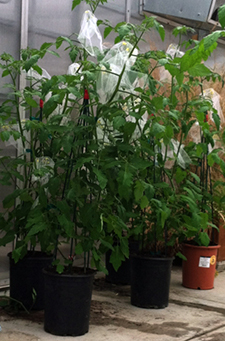 At the end of the two weeks, the plants were returned to the SF State greenhouse so their tomatoes could grow under uniform conditions. 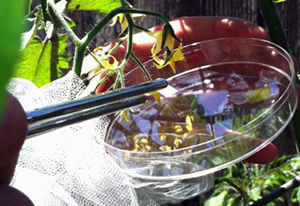 In addition to self-pollination and open-air pollination, LeBuhn and Potter also artificially pollinated some of the tomato plants' flowers, including by using a tuning fork to simulate the frequency at which bees buzz, releasing pollen. The plants that were available for bee pollination significantly outperformed the control group, producing more and larger tomatoes. In addition, the open plants did just as well and in some cases better than the artificially pollinated plants, indicating that urban farmers do not need to "import" honeybees to pollinate their gardens, as wild bees can do the job. "We were actually surprised," LeBuhn said. "We expected to find that there was not adequate pollinator service in the city, but in fact we actually found bees do quite well. Anybody who grows tomatoes in San Francisco knows it's really hard to grow them here, but our data says it's not because of the pollinators." Even more surprising, neither the size of the garden nor the amount of green space in the surrounding area impacted the amount of pollinator service a plant received. Instead, the key factor was the "floral resource density," or the abundance of flowers present within the garden in which the tomato plant was located. The more densely flowers were grown within each garden, the higher the yield of tomatoes. LeBuhn and Potter placed tomato plants at gardens throughout San Francisco, such as the one seen above, to study the effect of native bees on pollination service. "This is good news in San Francisco, because we have very limited space for urban agriculture," said Potter, now an environmental consultant. "Small gardens with lots of flowers are enough to attract bees." That goes against many farmers' conventional wisdom that increasing the number of flowers in a garden will drive bees away from food-producing plants, LeBuhn said. The research shows that pollination is not a "zero-sum" game -- bees will visit both the crop plants and the flowers intended to attract them. Although the results could have major sustainability implications -- much of the food consumed in urban areas is grown hundreds of miles away and then shipped in -- LeBuhn says further studies are needed to compare the full cost of growing food in an urban environment versus rural areas such as the Central Valley. Her latest citizen science effort, The Great Pollinator Habitat Project, helps participants make their backyard garden, local park or green space more friendly to pollinators by evaluating the space and offering improvements designed to attract more bees. Increasing habitat is critical, as the population of pollinators in North America -- which are involved in the production of roughly one-third of the food we eat -- is declining rapidly, a phenomenon scientists call "colony collapse disorder." "We are at a point right now where pollinator service is adequate, but if the native bee populations are not sustained, we could see a significant decline in urban agriculture," LeBuhn said.